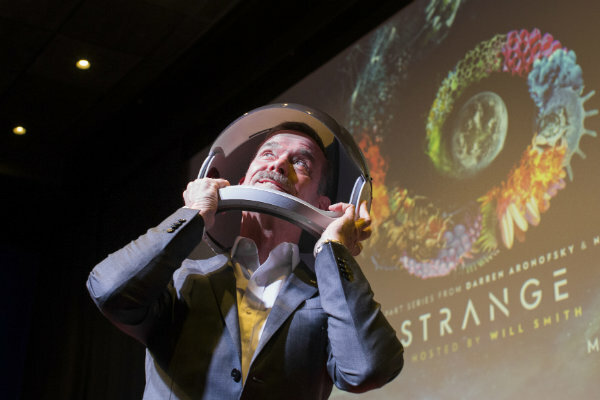 McCann NY and Framestore--two shops that teamed to bring us Lockheed Martin’s VR piece “Field Trip to Mars,” the single-most awarded campaign at Cannes 2016, earning 19 Lions across 11 categories (including Cyber, Entertainment, PR, Innovation)--have again collaborated on an immersive viewing experience, this time with National Geographic, debuting the One Strange Rock: Space Projection Helmet. The technology promotes One Strange Rock, a 10-part series which debuts March 26 on National Geographic. From executive producers Darren Aronofsky and Jane Root, One Strange Rock tells the extraordinary story of Earth, told from the only people who have ever left it: astronauts. Inspired by the innovative storytelling in One Strange Rock, National Geographic created the Space Projection Helmet to bring this unique astronaut vantage-point even closer to those on Earth. The limited-edition gear was exhibited earlier this week during an event at the Whitby Hotel Theater in New York City and will go on tour of schools and planetariums in select cities this spring. The Space Projection Helmets were also showcased during a recent premiere event at Lincoln Center’s Alice Tully Hall in New York City. Housed in a replica space helmet, the projection technology creates an immersive viewing experience through a unique combination of laser projection, custom fish-eye optics and in-built audio. Unlike in-market VR headsets, the helmet offers an exceptionally wide field of view and is designed so the user can freely move their head inside of the dome to look around the entire field of vision, just as an astronaut would within his or her helmet in space. The Space Projection Helmet will travel to schools and planetariums in select cities this spring, including the Center of Science and Industry (COSI) in Columbus, Ohio, and Liberty State Science Center in Jersey City, NJ, so that new audiences will be able to experience the mesmerizing, first-hand footage from One Strange Rock. Hosted by Will Smith, One Strange Rock is a mind-bending, full-sensory journey that explores the fragility and wonder of our planet. It’s the extraordinary story of why life as we know it exists on Earth. This series reveals the twists of fate that have allowed life to emerge, survive and thrive on Earth. The show features astronauts Nicole Stott, Jeff Hoffman, Leland Melvin, Mike Massimino, Peggy Whitson, Jerry Linenger, Chris Hadfield and Mae Jemison. One Strange Rock is executive produced by Aronofsky and Ari Handel from Protozoa Pictures and Root and Arif Nurmohamed from Nutopia. McCann’s helmet team included Eric Silver, chief creative officer, North America; Tom Murphy and Sean Bryan, co-chief creative officers, NY; Chris Mitton, executive creative director; Nir Refuah, executive technology creative director; Pete Sherer, sr. copywriter; Rick Cohen, sr. art director; Ryan Quigley and Andrew Hajjar, associate creative directors; Nathy Aviram, chief production officer; Christine Lane, executive director--innovation; Cindi Blondell, executive producer; Courtney Fallow, lead producer--innovation; Jeremy Miller, chief communications officer; Neena Koyen, director brand communications; Savanah Brihn, group strategy director; Colin Parajon, sr. strategist; Eric Perini, sr. brand content creator; and Brett Berman and Aude Cuenod, brand content creators. Tomrrow Lab handled helmet design and production, with key contributors being lead designer Pepin Gelardt, lead interaction designer Theodore Ullrich, coordinator Shelby Thompson, associate designer Ben Oppenheimer, product design engineer Tan Tran; interaction, interaction designer Jing Wen Zhu, electrical engineer Dorian Fernandez, interaction designer Joe Saavedra and assembler Lucy Yip. The Framestore ensemble on content production included exec producer Christine Cattano, sr. producer Pete Jones, producer PJ Stegall, director/creative director David Estis, editors Sam Goetz and Jake Sadowsky, CG lead Gabriel Portnof, compositing leads Matt Pascuzzi and Steve Drew, and compositor Zavier Mojica. Hook handled software development with director of engineering Norman McGarry and producer Kathryn Newman. Lead helmet fabricator was Jude Henson Oliver of Tricreation, which teamed with Forecast 3D on helmet fabrication. The "Fearless Girl" statue that inspired millions with a message of female empowerment has a new permanent home in front of the New York Stock Exchange.